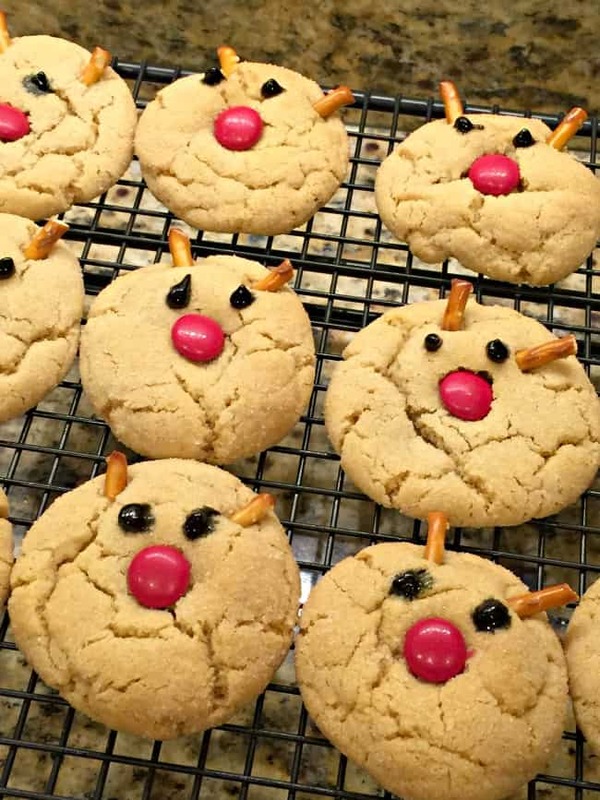 This recipe for traditional peanut butter holiday cookies is fancied up a bit when you add a red M&M to make a reindeer's nose and little pieces of pretzel sticks for antlers! 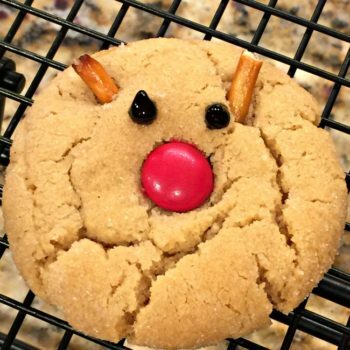 Now you have reindeer peanut butter blossom cookies! If you are ever invited to a Pampered Chef party- by all means go! And in addition to buying the food chopper This is an affiliate link: MomOf6 earns a commission if you purchase, at no additional cost to you. (which everyone seems to buy! ), be sure to also purchase this “ measure all cup This is an affiliate link: MomOf6 earns a commission if you purchase, at no additional cost to you. “- which makes it so super simple to measure sticky things like molasses and peanut butter. 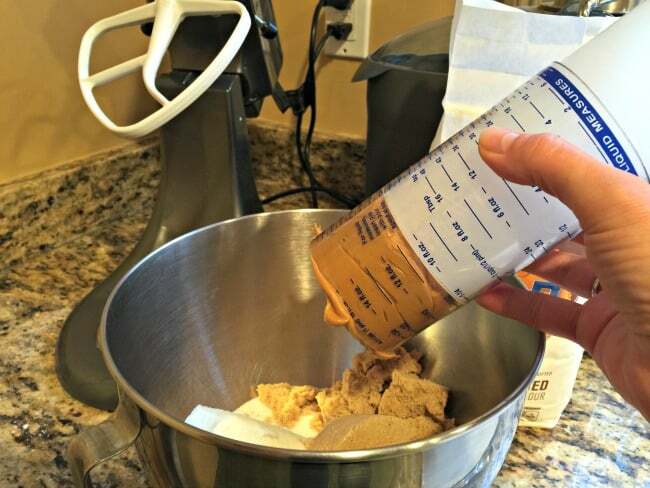 You simply add the peanut butter into the top of the cup, and then just push the inner piece to pop out the peanut butter into your mixing bowl! I love it! When it comes to baking the reindeer cookies, I suggest adding the antler pretzel pieces before baking the cookie. 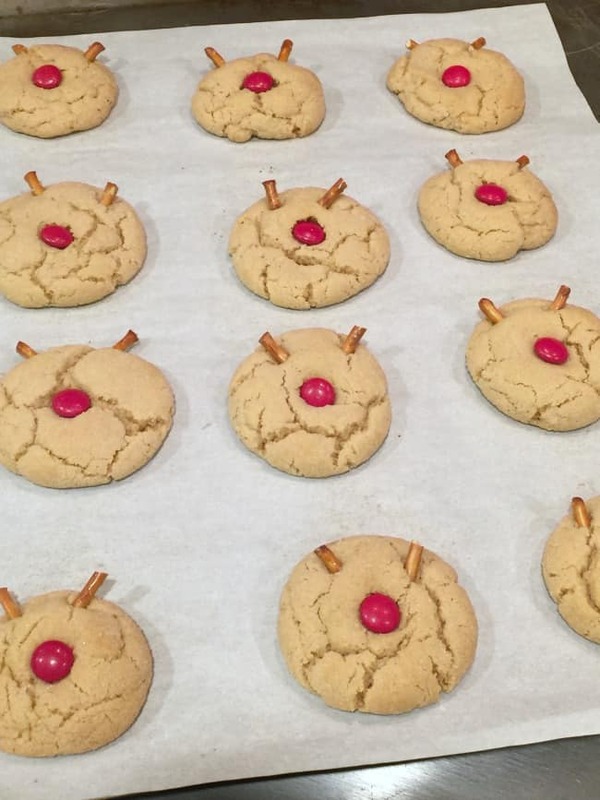 They will stick to the cookie better this way. After the cookies have completely cooled- pipe on eyes. I used black gel icing This is an affiliate link: MomOf6 earns a commission if you purchase, at no additional cost to you. , but you can use any type of dark icing with a narrow tip. 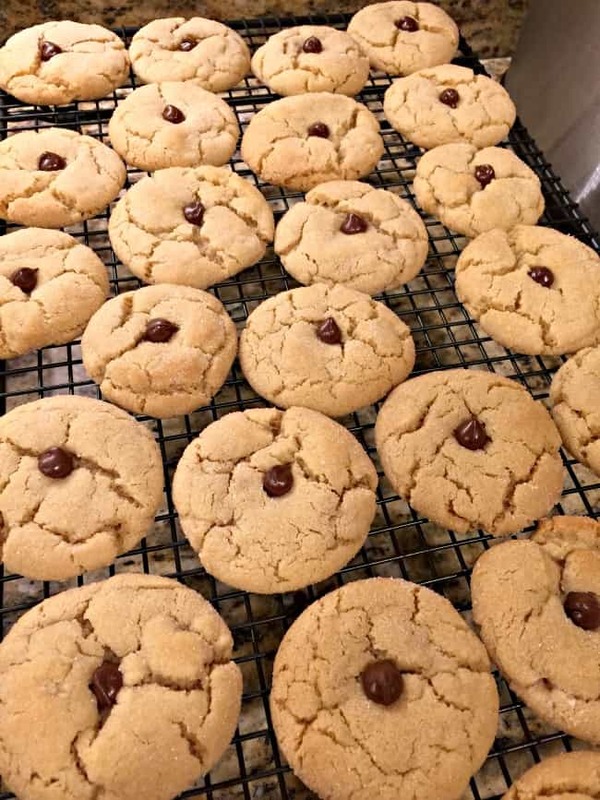 Of course- you can always just go the traditional (boring) route, and use large chocolate kisses for the cookie's center, or even chocolate chips if you want a higher cookie to chocolate ratio. 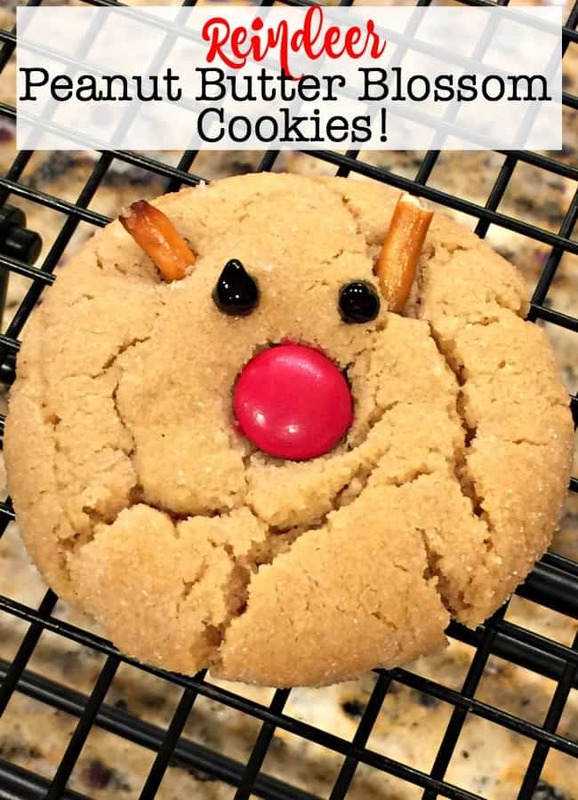 These reindeer peanut butter blossom cookies takes the traditional holiday cookie up a notch when you add a red M&M to make the reindeer's nose and little pieces of pretzel sticks for antlers! Using your electric mixer, beat together both sugars and the shortening until nice and fluffy. Add in the peanut butter, egg, milk, and vanilla and mix well. In another small bowl combine the flour, baking soda, and salt and then add slowly add the dry ingredients to the peanut butter mixture. Chilled dough for at least one hour. Roll dough into balls and the coat in granulated sugar. Take small pretzel sticks and break them into thirds. 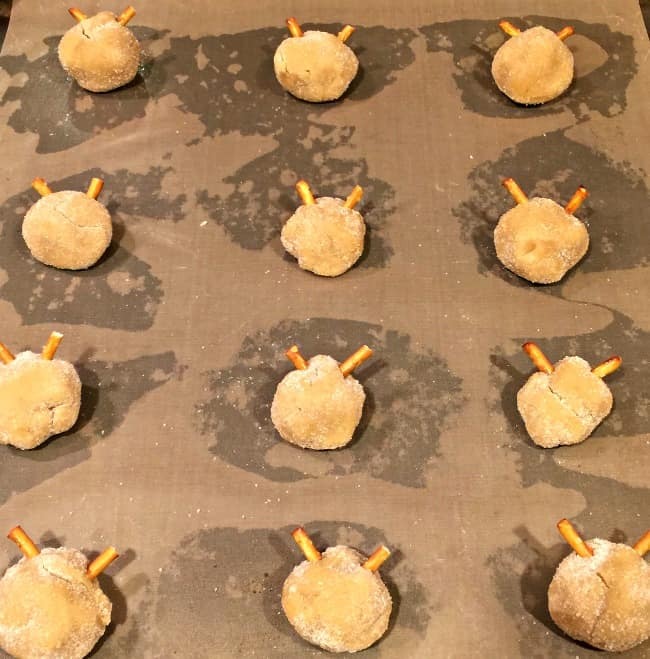 Add two of the small pieces to the top of the dough ball to create antlers. Bake at 375° for 10 -12 minutes. After the cookies are removed from the oven, add on the red M&Ms and then allow them to fully cool. Use gel icing to create the eyes. Cute, cute, cute!! Just pinned and will be baking some asap!